Biopic soundtrack includes five tracks from Queen's 1995 Live Aid performance — first time audio! For the first time ever audio tracks from Queen's legendary performance at Live Aid are being released as part of the soundtrack album to Bohemian Rhapsody, 20th Century Fox and Regency Enterprises' 2018 feature film celebrating the band, their music and their extraordinary lead singer Freddie Mercury. Recorded at the historic Wembley concert in July 1985, these Live Aid songs are among the rare gems and unheard versions from the band's rich catalogue. 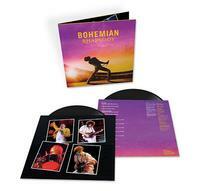 Alongside the show-stopping Live Aid performances of "Bohemian Rhapsody", "Radio Ga Ga", "Hammer To Fall" and "We Are The Champions," the album features other rare live tracks spanning Queen's entire career, new versions of old favorites, and a choice selection of the band's finest studio recordings. Among them are some of Queen's biggest hits, including 11 all-time greatest anthems that reached No. 1 around the world. Bohemian Rhapsody the film stars Rami Malek as Freddie, Gwilym Lee as Brian May, Ben Hardy as Roger Taylor, Joe Mazzello as John Deacon, and Lucy Boynton as Freddie's lifelong companion Mary Austin. The soundtrack features all-original Queen recordings and vocals, produced by Brian May and Roger Taylor, with engineering and co-production by long-time Queen studio collaborators Justin Shirley-Smith, Kris Fredriksson and Joshua J Macrae. The key task for the team behind the Bohemian Rhapsody soundtrack was sourcing the most suitable versions of the band's songs, especially live performances, to fit the screenplay's career-spanning narrative. Their brief was not merely to produce a greatest hits playlist package but a soundtrack album to stand on its own merits, underscoring key moments in the screenplay. May, Taylor, and their co-producers worked with the filmmakers to find the best versions of each track to heighten the dramatic power of each scene. Ensuring that listeners are in no doubt they are listening to a soundtrack album, Brian came up with the inspired idea that Queen should record their own arrangement of the famous 20th Century Fox Fanfare. Featuring May's famous multi-layered guitars and Roger Taylor's distinctive percussion, this revamped track provides a suitably flamboyant opening fanfare to both film and album. The five tracks from Queen's 21-minute performance at Live Aid on July 13, 1985, have never been released in audio form before. They've only ever been featured on video as a special extra on the DVD/BluRay release of Queen Rock Montreal, which features the Montreal Forum shows of November 1981. The Live Aid audio is exclusive to this new soundtrack album. Other tracks on the soundtrack have been sourced from different decades and even different continents. "Fat Bottomed Girls" comes from the 1979 Paris shows, part of the Jazz world tour, and has never been released before. "Now I'm Here" was recorded at the band's 1975 Christmas Eve show at London's Hammersmith Odeon. And the history making duet between Freddie and Brian on "Love of My Life" comes from the Rock in Rio festival of January 1985 when 300,000 Brazilians sang along. Previously this track was only available to fans on the video releases of this performance. The three remaining songs on the soundtrack will be fresh to Queen fans, old and new. "We Will Rock You" starts out as the studio version, then seamlessly blends into a live performance with audience participation. This has been created especially for the film. "Don't Stop Me Now" features Brian's newly recorded guitar parts and is much closer to how the band plays the track live today. "Doing All Right" was originally recorded by Smile, the predecessor band to Queen that featured Brian and Roger with vocalist Tim Staffell. When Tim later left, Roger and Brian would join forces with Freddie to form Queen. Freddie's interpretation of the song is featured on the first Queen album. To recreate the original Smile version, Brian and Roger reunited with Staffell at Abbey Road Studios to re-record "Doing All Right" for the Bohemian Rhapsody soundtrack. This session which featured Roger, Tim and Brian all singing lead vocals took place almost 50 years after the original Smile recording. "Bohemian Rhapsody" is regularly cited as one of the greatest songs ever recorded. In 2004, the song was inducted into the Grammy Hall of Fame and Freddie Mercury's vocal performance was named by the readers of Rolling Stone magazine as the best in rock history.